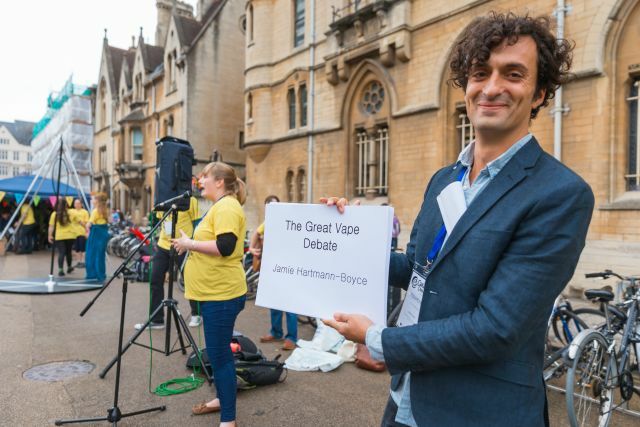 We speak to Jamie-Hartmann Boyce, a senior researcher in the Nuffield Department of Primary Care Health Sciences, about her song-writing and 'vape-debate' adventures at Curiosity Carnival, a huge event that bought Oxford's incredible research to the public as part of European Researchers' Night. 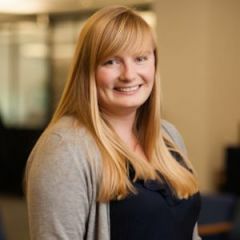 I work as a senior researcher in health behaviours, focussing on obesity and tobacco control. Most of my work consists of systematic reviews of interventions to help people quit smoking or to help people lose weight – this involves going out and reviewing all of the studies on a topic, and then bringing them together so that people making decisions – whether they be patients, carers, doctors, or policy makers - have the best available evidence to hand. Why did you want to take part in Curiosity Carnival? I thought the Curiosity Carnival would be a great avenue through which to engage with the public further, and the research I focussed on as part of the Carnival was our recent review of electronic cigarettes. The reason I was so keen to focus my activity on this particular area is that there is still a lot of uncertainty amongst the public about whether people who smoke should switch to electronic cigarettes. Despite the fact that an estimated 2.9 million adults in Great Britain currently use e-cigarettes, in a recent nationwide survey, only 13% of the British public accurately understood that e-cigarettes are a lot less harmful than smoking, and I think it’s really important to get the best available evidence out there. Plus, I thought the Carnival sounded fun – and quite different from what I do in my day job! What was the activity that you organised? My particular activity for the Carnival involved working with a science singer-song writer (Jonny Berliner) to write a song about electronic cigarettes. Putting research findings into a song presented a unique challenge in terms of communicating findings succinctly whilst still maintaining accuracy. It was great to work with Jonny because it really helped me clarify what I wanted to communicate. It’s also been exciting that the song has existed beyond the Carnival itself - I put a recording up online a couple of days ago and tweeted about it, and already it’s been listened to almost 400 times. Listen to the song. Why do you think engaging the public with your research is important? I think it’s incredibly important that researchers engage with the public, and I feel this particularly strongly when it comes to public health research. The research I do is funded by taxpayers and charities, and I view it as a moral imperative to share our findings with as many people as possible, so that they have the best available evidence to hand when making decisions about their health. How has engaging the public with your research benefitted you? Engaging the public with our research has benefitted me in a number of ways – personally, it keeps me motivated, and reminds me regularly why I choose to work in the field I do. It also helps keep me to task in terms of focussing our research questions on what’s really important. And as an added bonus, it gets me out of the office and using my more creative side.